Celebrate the FIRE of your love with our original and innovative wedding entertainment! with a fire show- the perfect wedding reception entertainment choice to guarantee a day to remember. A beautiful sunset fire performance choreographed to your special song, or a spectacular group fire show, makes a great addition to your special day and will captivate your guests. For extra ‘Wow’ factor, flame effects can be added to our finale to truly impress. your guests with our roving entertainers; talented contact jugglers who skillfully perform illusions with mesmerizing crystal balls, graceful flow wanderers who mystify the crowd with levitating wands, and interactive magicians who amuse and play with the guests. Your friends and family join in the fun without having to be ‘on stage’- the perfect way to create interest, ice breaker conversation, and entertainment while guests are waiting for your big entrance. Our shows are the perfect complement to resort and beach weddings, or any venue with an outdoor area. 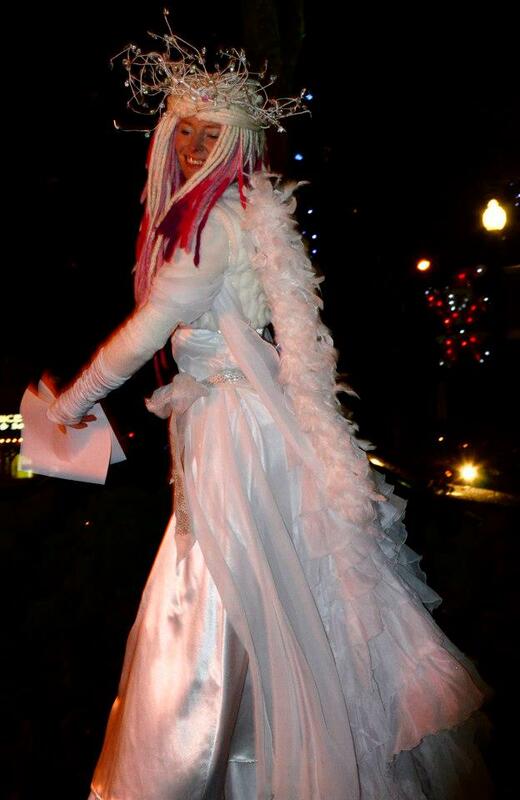 Small flame shows, roving entertainment, and LED stage shows can be performed at most indoor venues too! Our confident, experienced and easy going wedding entertainers ensure that whilst we concentrate on exciting fire and circus performances to thrill and amaze, you can simply relax, and enjoy. Our spectacular wedding entertainment packages start at $500.00 for a 15 min two person fire show, plus travel (if you are outside the Central Island area). Contact us NOW to book! It’s Halloween, and this Circus has a Dark Side! 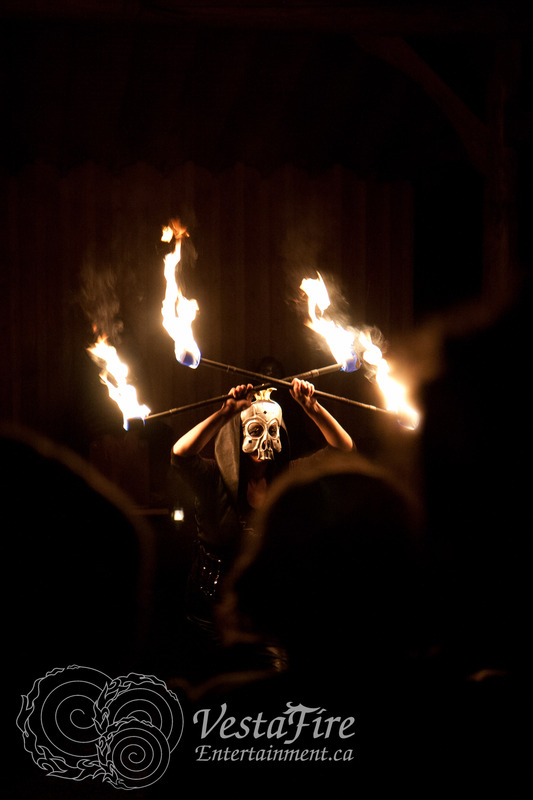 Come join VestaFire for a spectacular private show full of Halloween Spookery! We would like to invite our family, friends, and local fans to a special private 30 min showing of our favorite fire theatrical acts. We will also be selling Hot Chocolate and baked goodies by donation to Kat’s upcoming Spark Circus trip- teaching and performing for the orphans and refugees on the Burma border. Admission- only $ 5 per person, and kids under 5 are free! Bring your own Chairs, Mug, and make sure to Bundle Up! Don’t forget your Camera too- we LOVE to see fan photos!! 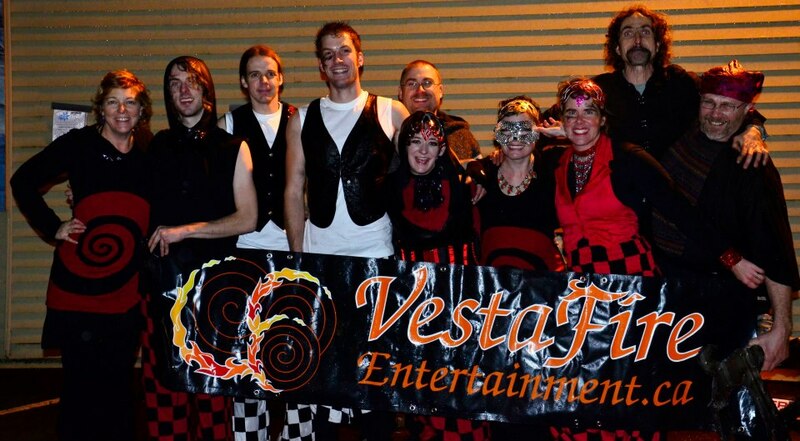 VestaFire was excited to be involved in the Downtown Courtenay Business Association’s Winterfest celebrations on Friday! We performed a spectacular corporate gala fire show, and provided roving entertainment as our Illuminated Angel Stilt Dancer! We’d like to thank all our volunteers, cast and crew- I’m so proud of all of us!! Not only was it a great ‘show’ for the public, but behind the scenes was very smooth and professional. Our dip kit station ran like clockwork, and our ever watchful fire safety crew were vigilante and at-the-ready. The new propane cannon worked like a charm, and the crowd LOVED the fireballs- especially when we wheeled it out onto centre stage at the finale!! A GREAT show, and we’ve already received many more ‘likes’ and comments from the audience on our facebook page- as well as some great fan Photos! Thank you so much! Here’s the clip video from the show- many thanks to Bird Of Prey for allowing the use of his music, and to Kevin for filming and editing. Courtenay WinterFest Corporate Gala Fire show promo video!